Jaron Lanier on the TED stage. He either coined or popularized the term "virtual reality." In the 1980s, his startup created the first commercial VR products, avatars, and multi-person virtual world experiences. His writings are known for proposing a humanistic approach to technology. He's the author of several books including the international bestsellers Who Owns The Future? and You Are Not A Gadget. His most recent book is Ten Arguments For Deleting Your Social Media Accounts Right Now. RAZ: Do you use Twitter? LANIER: Nope, nope, nope, nope, nope. RAZ: This is Jaron Lanier. And although you might guess it from his social media presence, Jaron's a technologist - actually, a pioneer who's thought a lot about how and why the Internet evolved into a place where advertisers compete for everyone's attention. Jaron's worked in tech pretty much his whole life. LANIER: I showed up in Silicon Valley at the start of the '80s and became a freelance video game designer in the very early days. RAZ: For a while, he worked at Atari. LANIER: I had a hit game in '83, I think, that nobody remembers anymore - in the 8-bit era. It was called Moondust. RAZ: And Jaron actually founded the first virtual reality company. LANIER: It was the most thrilling way to spend one's 20s that you could imagine. It just felt like we were at this moment of the creation of a new universe. It was an extraordinary feeling that doesn't exist today, although we still kind of try to evoke it in our rhetoric. It was an amazing time. RAZ: But even with all of that optimism, there were some concerns about the dark side of what might evolve from all that new technology. 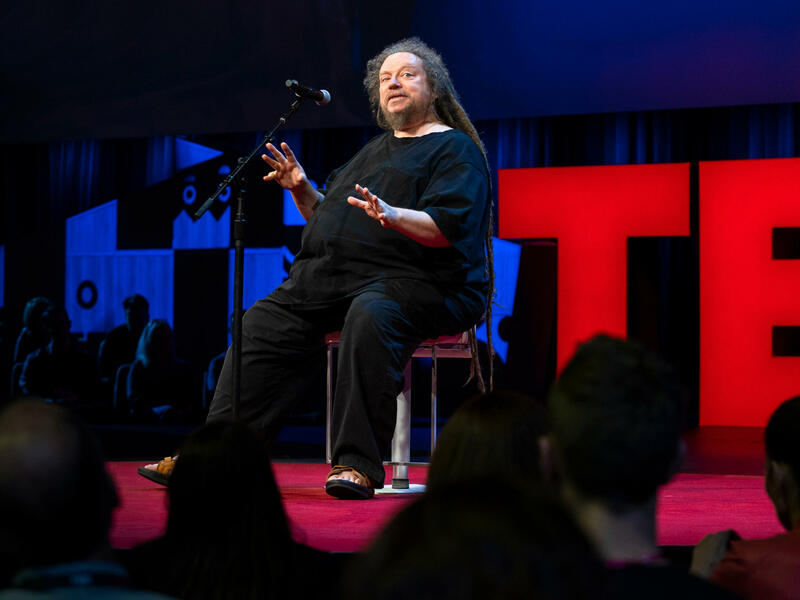 Here's Jaron Lanier on the TED stage. LANIER: The idealism of digital culture back then was all about starting with that recognition of the possible darkness and trying to imagine a way to transcend it with beauty and creativity. It was a beautiful vision, and it's one I still believe in. I suppose I could mention one of the very earliest computer scientists, whose name was Norbert Wiener, and he wrote a book back in the '50s from before I was even born. And in the book, he described the potential to create a computer system that would be gathering data from people and providing feedback to those people in real time. And he has this amazing line where he says, one could imagine a global computer system where everybody has devices on them all the time, and the devices are giving them feedback based on what they did, and whole the population is subject to a degree of behavior modification, and such a society would be insane, could not survive, could not face its problems. And then he says, but this is only a thought experiment, and such a future is technologically infeasible. And yet, of course, it's what we have created. What my friends and I desperately wanted was exactly the opposite of that. We wanted a world of great creativity where individuals would find themselves and surprise everybody with brilliance. It was clear, though, that computers could go either way. And the thing is, it seems like we lost that war. You know, I - it's kind of the tragedy of my generation. So here we are, and now what we're trying to do is figure out how to unravel our mistakes. RAZ: So what happened, in your view? Like, how did we get to a world where advertising algorithms are constantly battling for our attention and tech companies are, you know, essentially manipulating our behavior? LANIER: All right, so the core problem of companies like Facebook is perverse incentives. It's that the way they make money is from manipulating people. It's from exacting behavioral change. This advertising model arose because everybody was backed into a corner. And the way I remember it - I was around Google when it was really just starting. I don't think people wanted it. I think it was just the only available solution because on the one hand, we loved our entrepreneurs. We worshipped Steve Jobs, for instance. But on the other hand, we wanted everything to be free. This idea of the advertising model was the only solution. And computers got faster, the algorithms got better, the customers and the users got more sophisticated, and the whole thing evolved into this massive behavior-modification scheme. And I don't think we can survive on this design. RAZ: So do you think that attention - and I asked this question to Zeynep and Tristan - I mean, do you think that attention has become commodified - like, that it's this huge resource now that big companies are just trying to capture? LANIER: Well, attention is, in a way, a laundered term. I don't think anybody cares what you're paying attention to because that in itself doesn't do anything for anyone else. What they really care about is the behavior that results. And the behavior might be negative. Like, it might be failing to vote in an election. Or it might be positive, like you might be purchasing something. So, you know, every penny that a company like Facebook or Google earns is because somebody believes that they're successfully manipulating someone else. We've created a society where if two people wish to have contact or collaborate or be aware of each other, the only way that can be financed is because there's a third party who believes they can successfully manipulate those first two people, and so attention is only a precedent to that. LANIER: What started out as advertising really can't be called advertising anymore. It turned into behavior modification. And so this is the dilemma we've gotten ourselves into. The alternative is to turn back the clock and remake that decision. Remaking it would mean two things. It would mean, first, that many people - those who could afford to - would actually pay for these things. You'd pay for search. You'd pay for social networking. How would you pay? Maybe with a subscription fee, maybe with micropayments as you use them. There's a lot of options. If some of you are recoiling and you're thinking oh, my God, I would never pay for these things, I want to remind you of something that just happened. Around this same time that companies like Google and Facebook were formulating their free idea, a lot of cyberculture also believed that in the future, televisions and movies would be created in the same way, kind of like the Wikipedia. But then companies like Netflix, Amazon, HBO said, actually, you know, subscribe; we'll give you great TV. And it worked. We now are in this period called Peak TV, right? So sometimes, when you pay for stuff, things get better. LANIER: We can imagine a hypothetical world of peak social media. What would that be like? It would mean when you get on, you can get really useful, authoritative medical advice instead of cranks. It could mean when you want to get factual information, there's not a bunch of weird, paranoid conspiracy theories. We can imagine this wonderful other possibility. I dream of it. I believe it's possible. I'm certain it's possible. And I'm certain that the companies - the Googles and the Facebooks - would actually do better in this world. I don't believe we need to punish Silicon Valley. We just need to remake the decision. RAZ: If we do nothing, and the way we consume the Internet and the way we interact with it just continues, what happens? What happens to us, to our behavior? LANIER: If we do nothing and we continue as we are, democracies will continue to devolve, and we'll end up in a world of autocrats who are somehow connected to the biggest computers. And we'll enter into the kind of dystopia that's been foreseen in science fiction. Eventually, something will come along that the society can't deal with, and we'll be extinguished. So if the species is to survive and is to be creative, we cannot fall into that trap. We simply cannot. RAZ: You know, Jaron, humans have been around as a species for, like, 300,000 years, right? And we haven't really changed all that much. But do you think that we humans are equipped to take in all of these inputs - like, to give all of our attention to things like social media? Like, is part of the problem that we just - our brains aren't built to juggle all this incoming information? LANIER: You know, I think we're designed for tremendous amount of input and a tremendous amount of memory. I think the problem with the digital era is, we get a lot of signals that are actually not real signals, like, you know, buy these shoes; go to this party; oh, you're not as hot as the other person - I don't know - just this endless stream of stuff. And so I don't think it's so much that we're being overwhelmed by genuine detail, but by pseudo-detail. And it's like we're in this behaviorist experiment where we're in this maze where instead of the world of sense and hues and shades and the subtleties of nature that are ever-changing and infinitely deep, instead, we're in this world of little buttons and lights and treat dispensers, and it's actually a curtailed, simplified world that seems complex just because having a lot of it kind of takes up our time, takes up our attention. But I actually think we are built for great deal of stimulus and detail, and we're not getting it. I think that the more accurate description of modern times is that we're starved for reality. RAZ: Jaron Lanier - he's a computer scientist who teaches and writes a lot about technology. You can see his entire talk at ted.com. POMPLAMOOSE: (Singing) Sometimes I don't pay attention, and I hit cars. Sometimes I don't pay attention, and I start wars. Sometimes I don't pay attention. You know what I mean. You know what I mean. RAZ: Hey, thanks for listening to our show on attention this week. If you want to find out more about who was on it, go to ted.npr.org. To see hundreds more TED Talks, check out ted.com or the TED app. Our production staff here at NPR includes Jeff Rogers, Sanaz Meshkinpour, Jinae West, Neva Grant, Rund Abdelfatah, Casey Herman and Rachel Faulkner, with help from Daniel Shukin, Lawrence Wu and Diba Mohtasham. Our partners at TED are Chris Anderson, Colin Helms, Anna Phelan and Janet Lee. If you want to let us know what you think about our show, please go to Apple Podcasts and write a review. And you can tweet at us. It's at @TEDRadioHour. I'm Guy Raz, and you've been listening to ideas worth spreading right here on the TED Radio Hour from NPR. Transcript provided by NPR, Copyright NPR.